Plumber Roger Blackman saw the knifeman run away after hearing the man scream twice – once when he was initially stabbed and then when he realised what had happened. 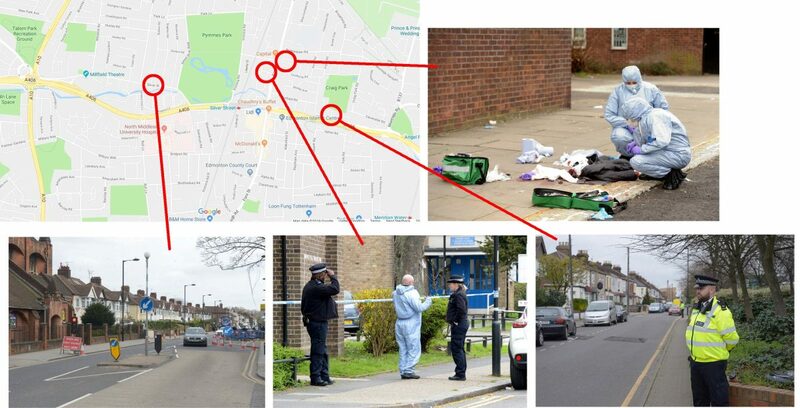 The victim who was the last of four knife attacks in a bloody stabbing spreesuffered potentially life changing injuries after the attack in Brettenham Road, off Fore Street in Edmonton, just before 9.45am on Sunday. Mr Blackman, 46, had been visiting his mum for mother’s day when he came face to face with the attacker. He had just taken his tools out the van to his mum’s flat on the estate and was walking back to his van to pick up a bouquet of flowers and a box of chocolate for his mum. Roger, who has lived in Edmonton all his life, said: “”There were two screams – I don’t think he first realised he had been stabbed in the back that initial moment. “The first scream was when he was stabbed and the second scream was when he realised what had happened. “I had parked my van outside and was taking my tools over to my mum’s house. “It was silent when I was walking back towards the van, and then between 10ft and 15ft away from me was the attacker. “He was facing towards Fore Street and all I saw was he was a dark coloured skin with a round head. “I heard a scream and as the victim turned around I saw the other man bending down. “In that second he turned around and ran off. I didn’t see his face. “I was three or four cars away from where it happened and I saw him [the attacker] bent over, spun around and run away. “He was a black or Asian man, he had darker coloured skin, and wore a hood. “But as I got closer, I saw he had been stabbed as there was blood pouring onto the floor. “I could see the blood pouring out of his back like a shower – I ran to the back of my van to get paper towels to press onto his back. “He had a thick coat on and a rugby shirt that was completely soaked when he fell to the floor on the main road, on Fore Street. “He must have been stunned when he was stabbed. His brain must have been foggy, he seemed to go into shock and once he got to Fore Street, he collapsed. “I saw another member of the public on the street waving at a police van and the first police man kneeling down in the picture next to me was the first officer at the scene. The self-employed plumber helped applied pressure to the wound before the ambulance arrived and described how he saw the horrific wounds as officers cut open the man’s rugby shirt. He said: “It was a horrific wound, it was in the middle of the back two thirds down and it was like a big gash. “The skin was opened up and it was pumping with blood. “I just used the towels to put pressure on the wound to stem the bleeding. Roger insisted he heard no argument or even an exchange of words between the man and the knifeman. He said: “Every time I open the van, I make sure to look around to see who is nearby as I have a lot of tools in the back. “I am very aware of my surroundings and who is nearby. “If there is a guy 10ft away from me and he was trying to mug him, I definitely would have heard it. “I would have heard them arguing or even talking if there was any discussion before it happened but the first think I heard was a scream. “So that guy just came up behind the man and stabbed him in the back without indication of what he was going to do. “The victim was wearing a beanie hat over his ears and was probably just walking through with his head down, not knowing what was about to happen, when the other guy has come along and stabbed him in the back. Roger was taken to Edmonton Police Station yesterday morning after the victim was rushed to hospital. He added: “Since it happened, I am trying to put it into perspective but if you worry about everything, you won’t function. “I went to Edmonton Police station yesterday to give a victim’s statement – two officers came later that day and said he was improving. “I am relieved to hear that his getting better but at the end of the day, people make decisions and we have got to live with them – this man has potentially life changing injuries. “It is not going to affect my life but I’m just glad I could help somebody and that it was not even more serious. “I just hope they catch the man that did this. “I was in the area at the same time. “There were police patrolling around the area this morning, it is still on my mind. I am worried for my mum and her elderly friends that live there. “My mum and her neighbours are worried to go out and if they do go out, their family worry about them. 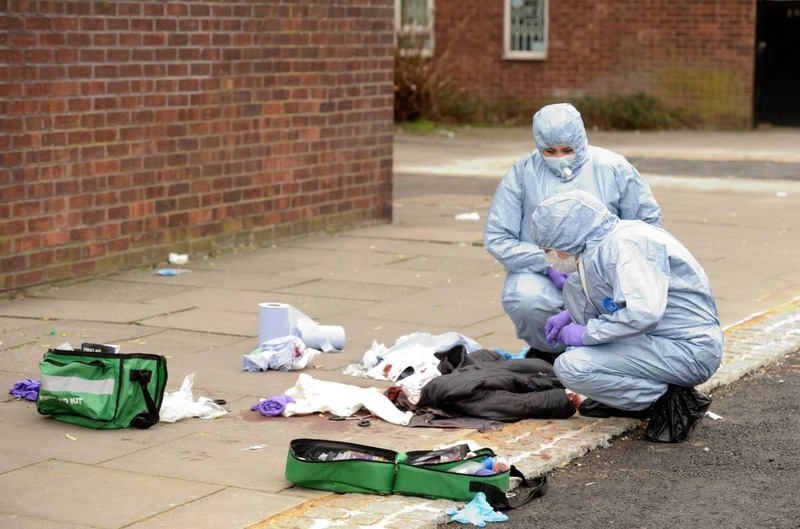 Detectives are still hunting the knifeman but have made two arrests. 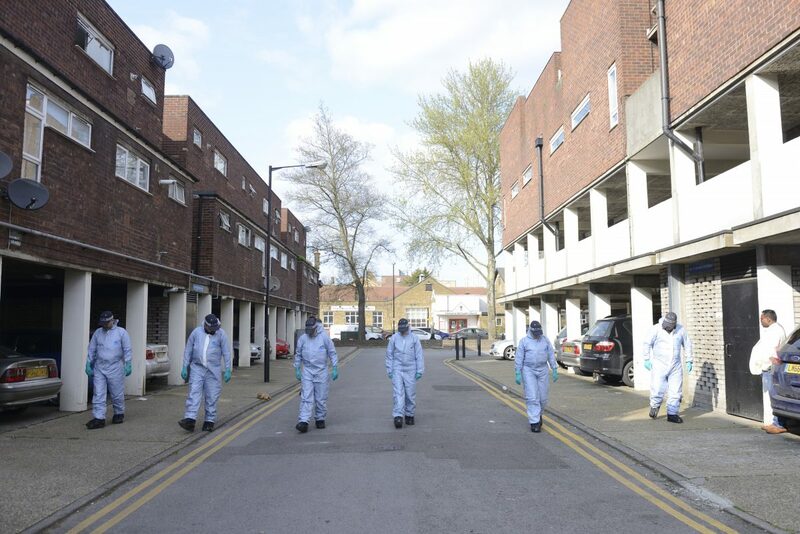 A/DCI Stuart Smillie from North Area Command, said: “The motive from the stabbing appears to be solely to inflict harm. “Early accounts suggest none of the victims were robbed or engaged in conversation before they were attacked. 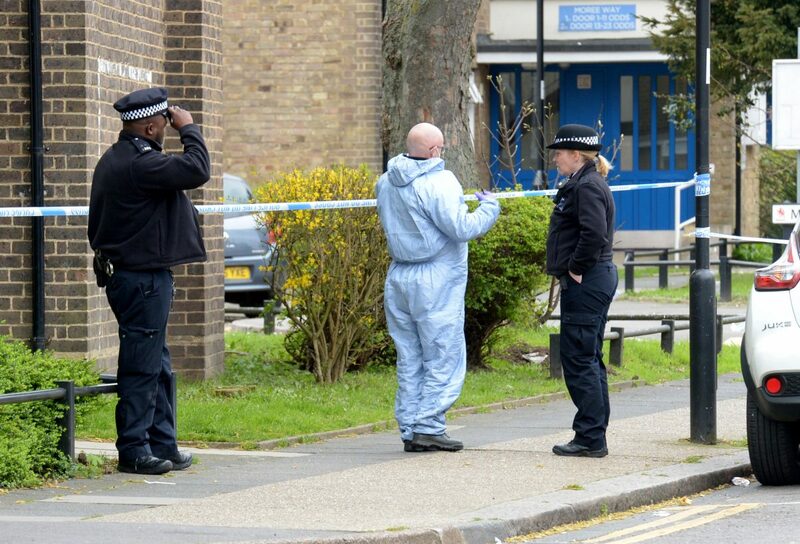 Scotland Yard said: “Two men have been arrested on suspicion of GBH – both remain in custody. “The first man was arrested in Fore Street at 10.53am on Sunday, 31 March.